Bread Man Recipe is used to bake Martin’s Men for the celebrations of St. Martin’s Day. In Germany they are called Weckmaenner or Stutenkerle. Sift flour into a bowl. Add sugar, yeast, a pinch of salt and mix it all together with a big spoon. Make a hole in the center, place the egg along with the egg white in the hole and cover with the flour. Warm the milk (lukewarm) and pour the milk into the bowl. Melt the butter in the microwave and add in the bowl. Knead the ingredients together with a handheld mixer using the kneading hooks. Cover with a towel and let the dough rise for about an hour, or until it has doubled in size. When ready, knead the dough again using your hands. Roll the dough with a rolling pin until it is a little more than a centimeter (0.4 in) thick. 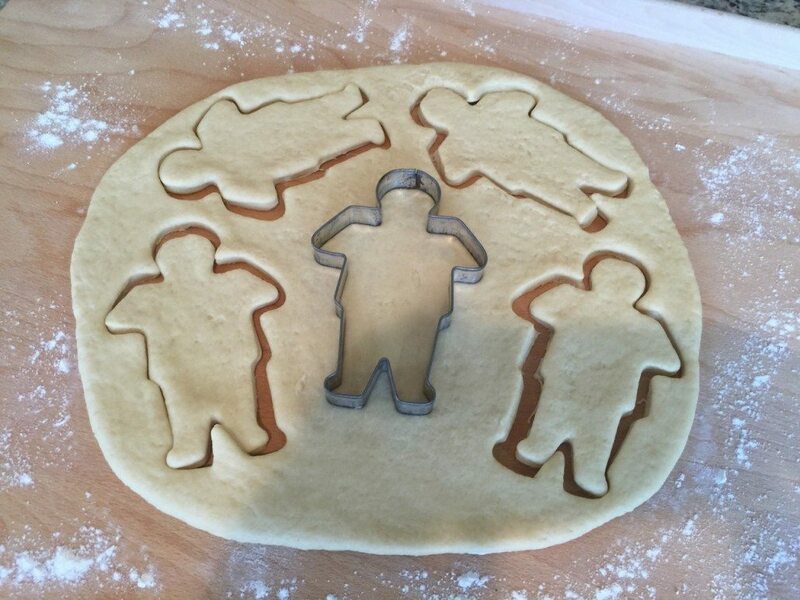 Use your cookie cutter (either 16,5 cm – 6.5 in or 14 cm – 5.5 in) and cut out your men. 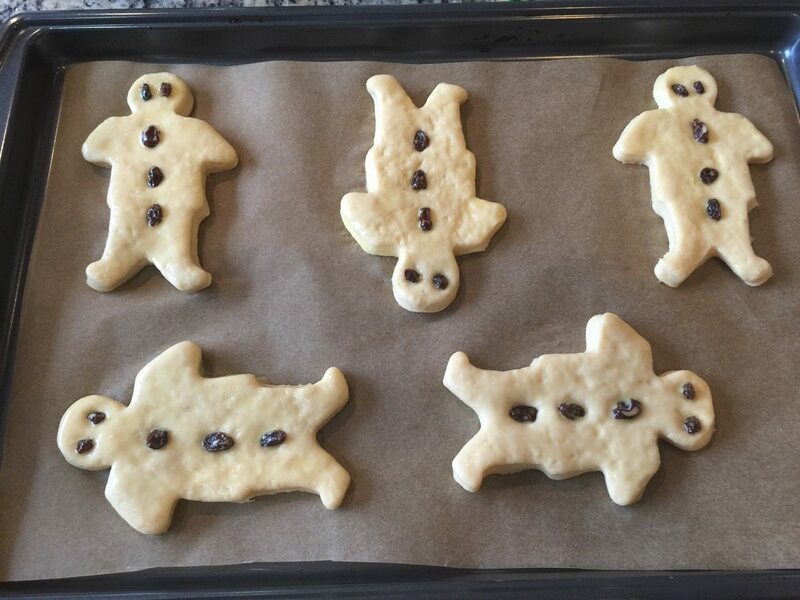 Place them on a baking sheet covered with baking paper. In order to give the men space to rise and not stick to each other, I usually do not place more than five men on one sheet (11 in x 17 in). Place the raisins for the eyes and the buttons on your men. Mix the egg yolk with 2 tablespoons of milk using a fork. Brush the men with the egg mixture. Preheat the oven to 190-200°C (375-400°F). Place the baking sheet on the rack just above the middle. Bake the Stutenkerle prepared with the bread man recipe for about 15–20 minutes, depending on how dark you want to have the color of your Weckmänner.